The Ruth Borchard Collection of British Self-Portraits in the Twentieth Century constitutes a labour of love on the part of a collector who conceived it as a logical extension of her taste for reading diaries, autobiographies and letters. The pictorial version of such introspective texts appears in the self-depiction of the artist, the decision to subject his or her own appearance to a necessary process of scrutiny, revisualisation and expression. Style, technique and medium may vary, but this basic decision remains central to all self-portraiture. Borchard, who died in 2000, wrote children's books, biography and a study of Jewish mysticism. 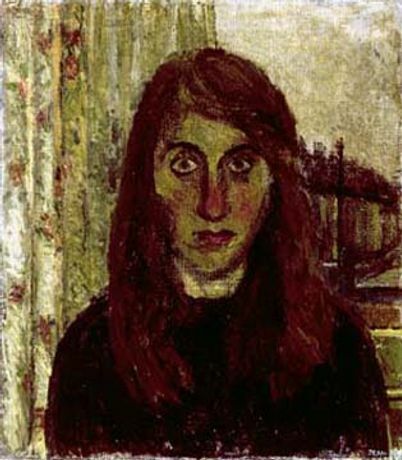 By the time she stopped buying self-portraits she had amassed a collection of 100 works spanning a period of fifty years from 1921 to 1971, each within Borchard's upper price limit of 21 guineas. In its range and intent Borchard's is a unique collection. Rooted in a period when British art was engaged in a lively re-examination of what figurative painting might mean, it encapsulates a tradition characterised more by variety than any conventional expectation. Born in 1910 and brought up near Hamburg, Ruth Borchard and her husband Kurt fled to England in 1939 to escape Hitler's National Socialists. They had four children. Apart from drawing attention to an extraordinary number of almost unknown paintings and drawings, the collection evokes the atmosphere of the London art world shortly after the Festival of Britain and, as such, represents a remarkable historical archive.